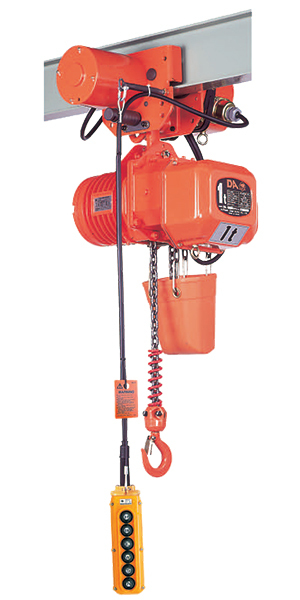 The DA/DB series hoist features a newly developed motor for severe conditions, which allows it to operate continuously for long periods of time with frequent starts within an hour cycle. These lifting speeds were engineered to be as fast as possible to ensure efficiency. Durable helical gears & an oil bath style gear case make these units quiet during operation. Our surface hardened load chain is manufactured within our factory in Osaka, Japan and is in compliance with ISO standard grade T, offering a satisfactory degree of breaking strength, wear resistance, and impact absorption. We can also offer load chain of a higher corrosion resistance upon request. A mechanical brake and motor brake – the electric-magnetic brake is combined with a mechanical brake to constitute a complete double brake system. Even the former alone has enough capacity to hold a static safe working load! A DC solenoid is used for the electro-magnetic brake. This lowers the electrical consumption throughout the operation of the electric chain hoist. The DA/DB series is designed so that the chain guide’s rotation on the load sheave transmits to the electrical limit switch. The electric limit switch automatically stops the operation of the hoist in the event that the load chain is raised or lowered to the chain’s end. In this case, the limit switch would also engage if dust or foreign matters remain pressed within the pockets of the load sheave. Electrical limit switch for this model acts in two steps. In the first step the limit switch breaks the operating circuit. Then within the second step, the limit switch breaks the main circuit. Ensuring the hoist ceases operation. Designed to gradually open and not break suddenly in the event of an overload. A compact thrust bearing also helps to prevent the load chain from twisting.